One of the great benefits of our democracy is that we prize the the right to intellectual freedom. Banned Books Week highlights the importance of upholding that right – all views can be expressed and heard, even if they are unpopular. Some places lend their characteristics to fiction a little easier than others. If I gave you the name of a state, you may be able to name two or three works of fiction that are set there (Quick: Georgia). 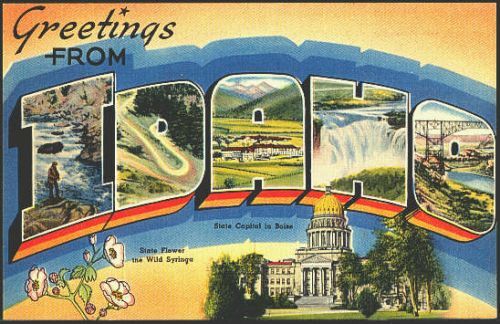 Idaho is slowly coming into its own in terms of sense of place. For many years, we’ve often been overshadowed by some of the flashier Western states (I’m looking at you Montana), but I think our turn in the spotlight is just beginning. Here are a few titles, some written by Idaho authors, but all with a great sense of their Idaho settings. Try a few and see if you can get an idea of what it means to live and breathe in this state (and see if you can recognize familiar places!). As usual, the annotations are courtesy of NoveList Plus and those with an * are highly recommended by yours truly. As World War I draws closer, seventeen-year-old novice sheep herder Walter Pascoe and his lover, trapper Trina Ivy, must face personal trials and losses as Walter is drafted into the military and sent abroad to fight. Returning home to the Idaho potato farm she fled twenty-five years earlier, Yumi struggles with her father’s terminal illness, her mother’s Alzheimer’s, her former best friend, and a former lover who once offended the town. Sharfeddin weaves elements of suspense and the supernatural through this accomplished western about an ornery loner of a sheep rancher, Chas McPherson, who hires a home health-care nurse, Mattie Holden, to care for his dying father, a once powerful, wrathful preacher now incapacitated by Parkinson’s. Idaho sheriff Bo Tully’s hopes about a rekindled romance with his high-school sweetheart are challenged by his father’s upcoming seventy-fifth birthday celebration and a ranch murder involving numerous possible suspects. A twelve-year-old girl and her younger brother go on the run in the woods of North Idaho, pursued by four men they have just watched commit murder–four men who know exactly who William and Annie are, and who know exactly where their desperate mother is waiting for news of her children’s fate. The owner of a struggling B&B in a picturesque Idaho town, Cate Nightingale, a young widow and mother, is forced to turn for help to her mysterious handyman, Calvin Harris, when a trio of vicious thugs threatens her and the entire town. Driven by youthful idealism, Thomas Deracotte and his pregnant wife, Helen, leave upper-crust Connecticut for a Utopian adventure in the Idaho wilderness, purchasing a dilapidated local farm and optimistically setting up housekeeping with the help of a local boy. Investigating the discovery of forty murdered Chinese gold miners in a 19th-century Idaho territory lake, lawman Joe Vincent teams up with an ambitious company researcher and a metis mountain guide to track the killers across the Pacific Northwest. A boy on an isolated rural Idaho farm during the 1950s tells about a murder. Working together on a summer construction project high in the Rocky Mountains, drifter Arthur Key, shiftless Ronnie Panelli, and foreman Darwin Gallegos reveal details about their pasts and beliefs in cautious and profound ways. Ruth, a young girl struggling to overcome haunting family memories in a town which will not ler her forget, gradually grows close to Sylvie, the sister of her dead mother. Follows a year in the lives of a Cold War-era trailer community in Idaho, where single moms Lina and Connie struggle with their sons’ exploits, their economic disadvantages, and the edicts of faith. Divorced and the mother of a college-bound daughter, Natalie is enjoying dating her neighbor, but they disagree over the possibility of having more children, until Natalie’s daughter comes home with a surprise addition that may change their lives forever. Questioning the widow of the late Ernest Hemingway, crime novelist Hector Lassiter fears that a surviving Hemingway manuscript may compromise his own reputation; while Professor Richard Paulson harbors suspicions that the author’s daughter murdered him. Remarrying years after the death of her first husband, scientist Nance challenges her personal demons by tracking rattlesnakes in Idaho, unaware of factors from her new husband’s past that challenge her relationship with her younger sister. Chronicles five generations of an American sheep-ranching dynasty, focusing on the beautiful daughter, Elizabeth, who threatens the family’s unity and her own identity, and details the lives of Elizabeth’s two husbands and her son. Eighteen years after being sent to prison for a violent crime, Vietnam veteran Bandy Dorner is finally released and is soon visited by the wife who cheated on him and his teenage son, prompting the three of them to explore whether they belong together as a family. 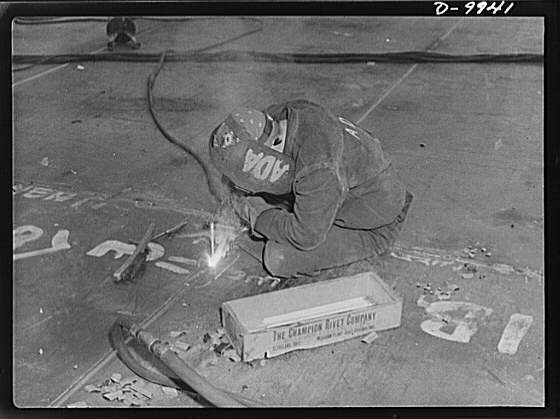 A woman working in a California shipyard during WWII. A history of American laborers from the beginnings of the twentieth century, through two world wars, to the technological revolution. A national political correspondent for Newsweek and the Los Angeles Times illuminates the war between union miners and their bosses in West Virginia in 1921, a conflict that eventual widened to involve federal troops. Citing the millions of children who are working under dangerous and exploitative conditions worldwide, a visual tour of the daily lives of child laborers offers insight into how economic disadvantages and unscrupulous systems are perpetuating child labor practices. Chronicles the history of race relations in Cochise County, Arizona, focusing on Sheriff Harry Wheeler’s 1917 arrest and deportation of two thousand striking Mexican miners. The author traces the history of child labor and reform in the US, drawing upon primary sources to portray this issue in six key industries, and examines the legacy of US child labor history for a global economy. This companion volume to a PBS documentary reflects a vivid appreciation of how Chavez’s organizing activities, dating from 1962, enabled one of society’s most vulnerable worker groups to assert dignity, claim rights, and ultimately change a powerful industry’s whole way of doing business. The Joad family, Okie farmers forced from their dustbowl home during the Depression, try to find work as migrant fruitpickers in California. An exploration of some of American labor’s central themes by a giant in the field, Hard Work is also a compelling narrative of how one scholar was drawn to labor history as a subject of study and how his approach to it changed over time. Inspired by his life-long support for labor, Gorn presents a biography of Mary Jones (1837-1930), who as Mother Jones remains one of the best known and best loved organizers and agitators in the US. He recounts her rabble-rousing during strikes at coal mines, steel mills, railroads, textile factories, breweries, and other hot spots across the country. A distinguished group of authors examines this resurgence and the potential of American unions with sympathetic yet critical eyes. Experts from a wide variety of disciplines — industrial relations, political science, economics, and sociology — identify the central developments, analyze the strengths and weaknesses of the new initiatives, and assess the progress made and the prospects for the future. Based on his own experience as an electrician and mechanic, Crawford makes a case for the intrinsic satisfactions and cognitive challenges of manual work. The work of builders and mechanics is secure; it cannot be outsourced, and it cannot be made obsolete. Such work ties us to the local communities in which we live, and instills the pride that comes from doing work that is genuinely useful. Lichtenstein provides a knowledgeable overview of the signal events since the Wagner Act of 1935, from unions’ identification with male-dominated heavy industries to their membership today, which consists predominantly of government and service workers and teachers. Triangle is the dramatic story of the fire that broke out in the Triangle Shirtwaist factory in New York City in 1911. Within minutes the flames spread to consume the building’s upper three stories. People on the street watched in horror as desperate workers jumped to their deaths. The final toll was 146 people-123 of them women. It chronicles in harrowing detail the fire and gives an insightful look at how this tragedy transformed politics and gave rise to urban liberalism. Studs Turkel records the voices of America. Men and women from every walk of life talk to him, telling him of their likes and dislikes, fears, problems, and happinesses on the job. Once again, Turkel has created a rich and unique document that is as simple as conversation, but as subtle and heartfelt as the meaning of our lives….